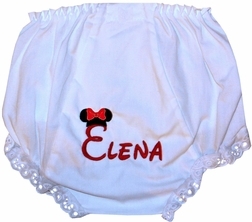 These durable little monogrammed Minnie Mouse bloomers are made with double the material in the seat to prolong their wear. The bloomers are made with embroidered eyelet ruffle edging, and are monogrammed with your little girl's name with Minnie Mouse's ears hat on top. If you choose to monogram the bloomers, please allow 2 to 3 weeks for shipping.